If you have mild to moderate dental decay, tooth-colored composite fillings can restore the integrity of your smile. These restorations are more aesthetically pleasing than traditional amalgam fillings, and they offer several structural benefits. Our team of doctors at Dentistry at the Heights in Brooklyn Heights, NY, can carefully select the shade of composite that blends with your teeth. We can also replace worn amalgam fillings with composite resin. Composite fillings can treat mild to moderate decay. If the cavity is more extensive, you may require an inlay or onlay, or a crown to restore your smile. Your dentist can closely examine your smile before recommending the best form of treatment. This may include taking digital x-rays or other advanced images, which can reveal the extent and location of decay. We may also incorporate our state-of-the-art DIAGNOdent® device, which uses laser fluorescence to detect cavities at their earliest and most treatable stages. Amalgam is a metal alloy containing a mixture of mercury, silver, tin, an copper. Due to its composition, it is much more visible than a composite filling. Composite resin is made of acrylic resin and a powdered glass filler. It can be color-matched to blend with the natural shade of your teeth. Composite is a great alternative for patients who wish to avoid mercury or for this with allergies to certain metals. 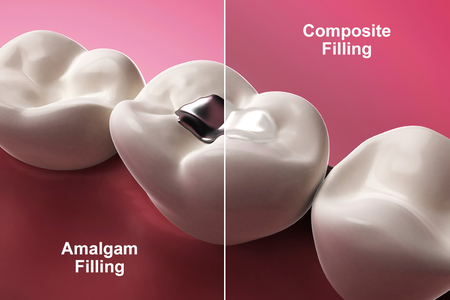 Composite fillings are more aesthetically pleasing than traditional amalgam fillings, and they offer several structural benefits. Amalgam expands when exposed to heat, which can cause small cracks to develop in the tooth. This change in shape can place the structural integrity of your tooth in jeopardy. Composite resin, on the other hand, does not react to temperature fluctuations. By maintaining a consistent size, resin can strengthen the tooth rather than weaken it. Prior to treatment, we can administer a local anesthetic to numb your gums. We can then remove compromised tissue and thoroughly clean and dry the tooth. For the best possible results, we will carefully layer the composite resin and use a special curing light to harden it in place. Once complete, your dentist will check to ensure the filling does not disrupt your occlusion. If necessary, excess material can be trimmed until you feel comfortable. Your doctor can then polish your tooth to add the finishing touches. With proper care, composite fillings can last for several years. Cavities should be treated as quickly as possible to prevent more extensive damage and the need for costly restorative treatments. To schedule your consultation, call our office at (347) 492-1018 or contact us online. Our friendly team members can review any questions you may have regarding the treatment process or the cost.